3 Bedroom Semi Detached House For Sale in Wadhurst, East Sussex for Asking Price £725,000. 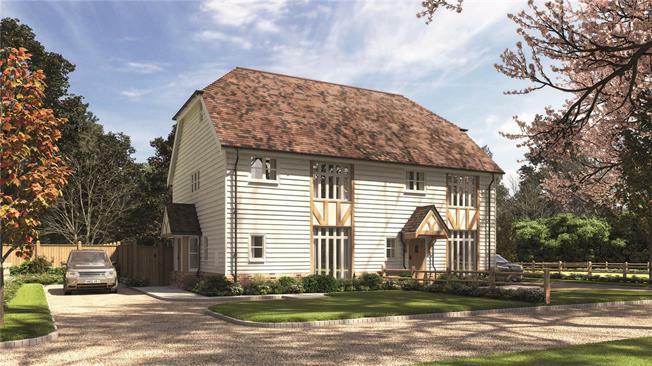 Clad in traditional timber boarding, this Sussex farmhouse style property blends in seamlessly with the natural local surroundings. The front driveway provides generous parking space, and the paved patio leads around to the lawn garden at the rear of the house. Hedges provide these back gardens with plenty of privacy, creating an ideal space for outdoor entertaining. Inside, the covered entrance opens into the spacious hall with generous cupboards and a traditional timber staircase leading to the first floor. The dining room, kitchen & family area is the perfect place for entertaining and relaxing, with bi-fold doors the natural daylight floods through the large room and invites you into the garden. The kitchen, with fully integrated appliances, such as the wine fridge, fridge freezer and oven combination microwave has everything required for modern day living. Upstairs, the master bedroom benefits from a walk-in dressing room and ensuite bathroom, which includes a separate bath and walk-in shower. Two further double bedrooms and a family bathroom are spread across the second and third floors, with all the bedrooms boasting large beautiful windows. Wadhurst Place itself is set within 18 acres of parkland and benefits from far-reaching views across the Weald, in the heart of the beautiful Kent countryside.